We’ve followed them through Retreat and Shelter, catching snippets of their unrequited love story along the way, all the time eagerly awaiting the moment we finally got to know the nitty-gritty of the youngest Warner, and the woman he loved from afar, so it was fitting the final book in this fabulous series we’ve devoured, should belong to Lane Warner and Brynn Fox-Warner. First up we have to mention the prologue. Wow! Talk about heart wrenching, it tore us apart and set up Lane and Brynn’s story, and what was to unfold, perfectly. Theirs is a journey of sacrifice, unrequited love, pain, forgiveness, loyalty, childhood friends to lovers, compassion, family and love, with the family theme running at its core. Whilst the Warner brothers may struggle to find soulmate love, they certainly have no trouble attracting danger – it seems to follow them like a shadow, thus bringing the suspense element to this cowboy, soulmate romantic series we’ve been greedily devouring the minute they’re in our hands. We were desperate to find out how Brynn came to be in the situation of being married to the Warner patriarch, Lane’s father, when she was clearly in love with Lane Warner, the youngest of the Warner clan, how did it come to be and why were these two keeping each other at arm’s length? All the Warner men, Cy, Sutton and especially Lane, had borne the scars of their mother’s cold, uncaring nature towards her husband and boys, her detachment, absences and cruel words had left a mark on them all, with love being an elusive conquest, until they met their soulmates. For Lane, his soulmate was right under his nose. Brynn Fox and Lane Warner had been childhood friends since they were 5 years old. Lane was her protector, regularly standing up for her at school when Brynn was tormented over where she lived, what she wore, and later vilified for the decisions she made in order to survive the cruelty she suffered at the hands of her awful mother. To say their history was complicated is an understatement. Brynn was the girl Lane always wanted but had convinced himself she was the woman he could never have. Brynn had rejected Lane’s marriage proposal in her teens, she loved Lane, so why would she refuse him? Well, all is revealed and much, much more! Boy these two sure did share some heartache and if any two people deserved happiness it was Lane and Brynn! Jay Crownover has entertained us, made us laugh, kept us riveted with suspense, and provided some tears along the way, ensuring we fell in love all with her beautiful characters. This series has been fabulous, though sadly, we felt let down by the epilogue in Escape. We wanted, no, we needed an epilogue to wrap up the Warner family journey, and unfortunately, we found it fell short. With this being the last book we would have loved a more comprehensive look into the future, a little bit more than what was delivered. Other than that this really has been a wonderful and unforgettable series, it’s just a shame we didn’t receive the finale we had anticipated. 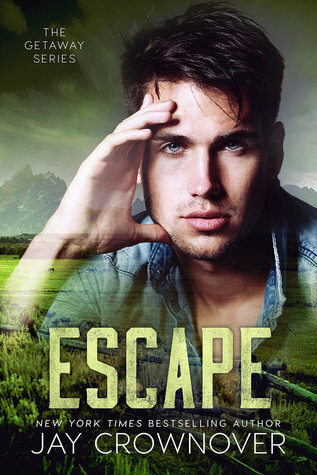 When Lane takes off, one thing is clear, the only choice Brynn has is to go after him.She’s going to bring her wayward cowboy home….whatever it takes.